We spent over 18 hours researching and testing 20 different types of lighted makeup mirrors and found that size of the mirror, power source, and design were most important. The Conair Lighted Make up Mirror scored high marks in all categories and is our top pick. We loved the oval shape and double-sided feature of this make up mirror. It looked terrific in the bathroom and added an elegant look to the vanity. The mirror rotates 360 degrees and can be magnified up to 7 times if needed. The soft lighting gives fog-free, clear viewing so you can put on makeup easily, even right out of the shower. Makeup mirrors are as old as time. They’ve been used for centuries to help woman and men with their grooming rituals, but lighted makeup mirrors are all the rage now. No longer do you have to position your mirror in perfect light. Now the mirror has its own built-in LED system that allows you to place it anywhere, and always get the perfect light. These top rated lighted makeup mirrors are the ones that customers consistently love to place on their bathroom countertops. You can be sure that with one of these mirrors you’re going to get the illuminating results that you crave. Then, in our buyer’s guide, we’ll talk about what features you want to look out for when it comes time to purchase an illuminated mirror for your bathroom. 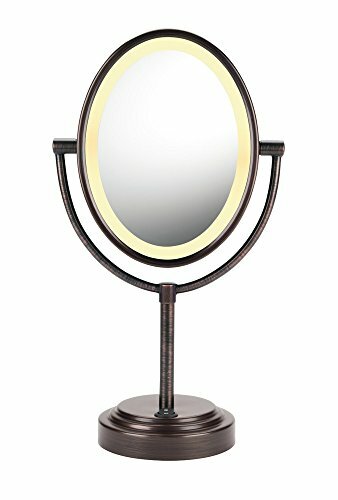 This lighted makeup mirror from Conair features an oval shaped design with double sided lighted mirror panels, and an oiled bronze finish. This mirror looks elegant on any bathroom countertop, and it rotates 360 degrees for up to 7x magnification. The soft halo lighting gives you clear, fog-free viewing, so that even when you’re right out of the shower your can use the mirror with success. This is a wonderful addition to any bathroom, and allows you to accomplish a number of tasks such as applying makeup, plucking your eyebrows, doing your hair, or any other tasks that you need to accomplish for your toilette. When it comes to self-grooming, the large mirror in your bathroom isn’t enough to see the fine details that you need to see, and that’s why this mirror is so helpful when it comes to getting the job done. It’s also quite elegant in design, so it will look sophisticated standing beside your lotions, creams, and perfume. The mirror is constructed from solid materials, so that you know that it’s going to stand the test of time. When it comes to purchasing bathroom products that you can trust, there’s no name more reliable than Conair. 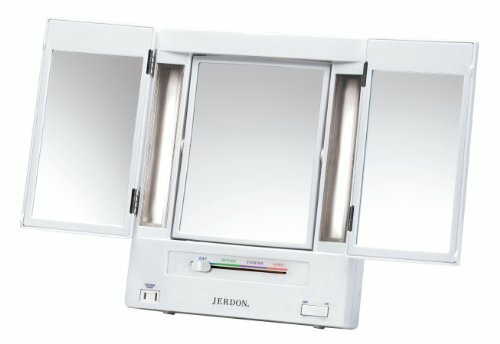 This lighted mirror from Jerdon features a trifold design and 5x magnification, with a sophisticated white finish. The magnification is adjustable, so you can get the level of clarity that you seek. It features a built-in electrical outlet, and has a sharp look and attractive finish that will certainly match any home decor. You’re going to get 4 adjustable settings for daytime, evening, and home and office environments, so you can see with clarity no matter where you are, or what time of day it might be. With this mirror, you can make sure that every detail is as it should be, so that you can easily pluck your brows, apply makeup, inspect your teeth, and so much more. This mirror is backed by a 1 year limited warranty, and that means that you’re guaranteed solid performance. There are many lighted mirrors on the market, but this one stands out from the rest because of its unique design and construction. Give yourself the gift of quality with a mirror of this superior caliber. This is a top pick because it helps you to see with clarity, and it also comes at a price that most customers can afford. This stunning mirror from Luxe Harbour features an LED light that looks perfect on any vanity table. This is the perfect Valentine’s gift for someone that you love, but it also makes a great birthday present, and it’s adjustable, so that you always get the perfect angle. The mirror is cordless, wireless, and portable, so that you can easily take it on the go. Customers love this mirror because the light helps with all your personal grooming. That means that it’s easier than ever to shave, tweeze, and shape your eyebrows with accuracy and precision. With this mirror there are no cords that you have to deal with, and that gives you more space on your bathroom counter top so that you have plenty of room to plug in other things. Not only is this mirror portable, but it’s also durable, so that you can be sure that it’s going to stand the test of time. There are energy efficient LED integrated lights that always stay cool while also conserving energy. The mirror is powered by 3 AAA batteries, and you never need to worry about replacing lightbulbs. All in all, this is a top rated mirror because customers love its excellent performance, and it’s quite affordable as well. These top rated lighted mirrors are the ones that customers swear by, because they’re easy to use and deliver dependable results. You can be sure that when you purchase one of these mirrors, you’re getting a product that is going to stand the test of time, while looking elegant and sophisticated in your bathroom. If you’re still not sure, then our buyer’s guide will help you to find a mirror that is just right for you. With so much out there to choose from, it’s best to know what your priorities are before you make a purchase. You’re going to want to know what size you’re looking for, and also how much you’re willing to spend before you buy. There are so many kinds of makeup mirrors on the market, that it can seem overwhelming when it comes time to purchase one. Cosmetic mirrors are important because they help you to see those fine details that you can’t see in your bathroom mirror. They come in a variety of sizes and styles, and some of them are wall-mounted, while others are portable. A freestanding mirror is a fine choice because it allows you to place the mirror wherever you want it to be, and then move it around if you need to. Vanity mirrors are also aesthetically pleasing, making attractive ornaments on dressing tables. When you want to use the mirror to apply makeup or check on blemishes, then you need to place the mirror where it receives good light. A lighted cosmetic mirror solves this problem by giving you LED lights that allow you to use the mirror no matter what the environment. Because there are so many kinds of lighted makeup mirrors, it’s important to know what options that you have so that you can make the best decision when it comes time to purchase. We’re going to talk about all the features that you want to look out for, so that you can get the best mirror possible. Lets start by taking a look at what kinds of lighted mirrors are out there. If you’re looking for a mirror that is suitable for travel, then you definitely need a small mirror that you can hold in your hand. These days there are some fantastic lighted mirrors that are small enough to hold in the palm of your hand, and they even come with cases and stands to make them very easy to use. You want to make sure that you have a travel case that is durable enough to withstand bumps and prevent scratches and cracks. Look for a mirror that has a hinged stand so that you can set the mirror down at a good angle. Small mirrors make for wonderful stocking stuffers around Christmas time, and they’re also great birthday presents as well. When you have a small mirror, it’s possible to move it around from room to room with ease. There are other features that are available such as swivel mirrors, swings, and tilt functions for adjustable positioning. When you’re grooming yourself, plucking eyebrows and even trimming your mustache, it’s important to get a good angle so that you can view every detail. Magnification is the perfect way to observe things in more detail, and it’s smart to get a small mirror that provides you with intense magnification on one side and normal magnification on the other side. There are some suction-cupped mirrors as well, and these allow you to adhere the mirror to various different surfaces. These kinds of mirrors are removable and adjustable, and they won’t damage any other mirror to which you adhere them to. Medium sized mirrors can be either portable or fixed, and when it comes to placing it on your dressing table, you can get three mirrors that fold, which is great for seeing side views when you are fixing your hair or applying makeup. Vanity units will have mirrors that are attached to them with a swing capability which is great for when you sit in front of it. Vanity mirrors also have small drawers for cosmetics and jewelry. Mid size mirrors are the most typical ones that you’re going to find on the market, and they’re the ideal size for seeing the big picture and also smaller imperfections. They are either freestanding, or you can adhere them to the wall in a fixed position. Either place the mirror in a spot where you get good natural light, or simply buy a lighted mirror so that you can place it anywhere in your home. It’s possible to find very high quality mid sized mirrors at a price that most consumers can afford. Most large vanity mirrors are not lighted, but it’s possible to find some that are. These are usually fixed to dressers or mounted on the wall, and they’re definitely not portable. With a large mirror, you can see your whole face, but you also get a view of your upper body as well, so that you can check out your outfit and overall appearance. This allows you to adjust the whole picture so that you can alter your appearance in the most satisfactory way. The lighting is always important with this kind of mirror, and that’s why getting a lighted mirror is the most ideal choice, but they are a little more difficult to find. Should you not be able to find a lighted mirror, then be sure to place your large mirror in a spot where you get good natural lighting. There are tons of illuminated mirrors on the market, and you can get one that is either fixed or portable. These can be integral parts of bathroom cabinets, and some are simple shaving mirrors that sit on extendable arms for adjustable positioning. When you’re using an illuminated makeup mirror in your bathroom, be sure to place it either in Zone 2 or 3, per the manufacturer’s suggestions. Some LED mirrors are suitable for wiring in both zones, but you need to double check to be sure. There are tons of illuminated mirrors on the market, and you can find them online or in retail stores. Be sure to try to see the mirror in person before you purchase, as this will help you to choose something that has the right level of light and the appropriate size. You also want to be sure to look out for something that is going to suit your bathroom decor, so that it fits the overall picture. A bathroom mirror is just as much about aesthetics as it is about functionality, so choose something that suits your tastes. Just because it’s illuminated doesn’t mean that it has to be modern in appearance. You can even find mirrors that are more vintage looking, but still has the LED function as well. No matter what you choose, you’re going to see that it’s easier than even to perform your grooming ritual with a lighted mirror on your bathroom countertop. Owning a lighted makeup mirror is a wonderful way to see everything up close, so that you can perform all your grooming rituals with ease. 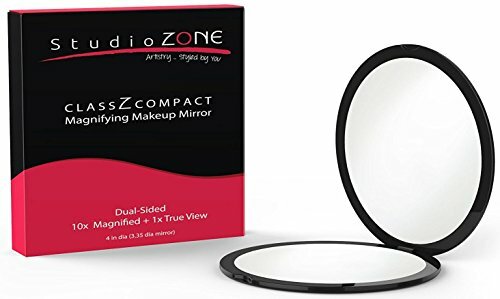 The top rated lighted makeup mirrors are a wonderful choice when you’re looking to buy something that is high in quality and also easy to use. These mirrors are customer favorites because they’re elegant and also portable, so that you can easily place them on your countertop without taking up too much space. There are various sizes of mirror that you can choose from, and what you select will be based upon how you plan to use your mirror most of the time.